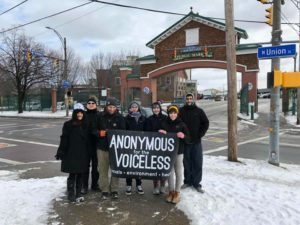 Thanks to Pana, Justin, Hannah, Theresa, Indego, Falicia and Darren for coming out in 20-degree weather to the Public Market on January 12th to show people the truth about animals being used for food. Many conversations were had as well many onlookers stopping to watch the footage. Thanks to Falicia for organizing and to Darren for hauling the equipment! Would you like to stand up with us next time? Follow our Facebook page for our Cube of Truth events or contact us!